You’ll need a little time to bring this all together and you may also want to do as the recipe suggests by putting the patties n the refrigerator to let them firm up. I couldn’t wait and for that and they were still awesome. Iprepared these and enjoyed them without the bun, simply laying down a hearty bit of avocado, then the patty, then the Salsa Fresca. Wow! I also took a couple Tablespoons of the juice from the Salsa Fresca and drizzled over the whole thing. the next time I prepare this I’ll probably skip the sour cream as well and just mash up the avocado with the lime juice and add a little cumin and some cayenne for some heat. Dang–this is terrific. This recipe makes 6 patties. Make the burgers: Heat 3 Tablespoons oil in a 12″ skillet over medium-high heat. Add onions, and cook, stirring, until soft, about 4 minutes. Add the garlic and Poblanos, and cook, stirring, until soft and slightly caramelized, about 5 minutes. Add cumin, paprika, coriander, oregano, and chipotle chiles, and cook, stirring, until fragrant, about 1 minute more. Transfer to a bowl and let cool slightly. Add breadcrumbs, beans, and eggs, season with salt and pepper, and mix well to combine. Divide mixture into six 5½-oz. patties, about 3″ wide x 1″ thick; place on a plate and refrigerate for 20 minutes or until ready to use. Mix vinegar, cilantro, tomatoes, garlic, and salt and pepper in a bowl. Cover with plastic wrap and let sit 20 minutes to allow flavors to marry. Combine sour cream, lime juice, avocado, and salt and pepper in a blender, and puree until smooth. Transfer to a bowl and cover with plastic wrap; store in the refrigerator until ready to use. Heat 2 Tablespoons of oil in skillet over medium-high heat. Dredge 3 burgers in cornmeal, and cook, flipping once, until toasted on each side and cooked through, about 4 minutes. Repeat with remaining oil, burgers, and cornmeal. 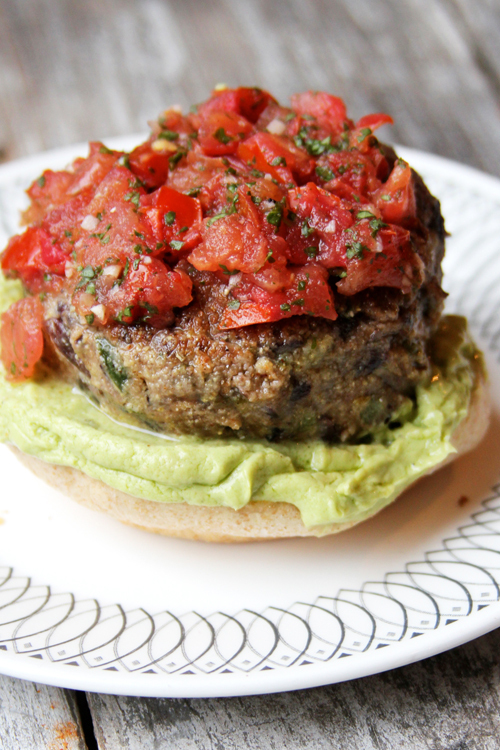 Spread the bottom half of each bun with avocado crema, top with a burger and some salsa and serve. Note: Burgers may be formed and frozen, sealed, for up to one month. Defrost as necessary, dredge in cornmeal as described in step 3, and cook.